So...peeps! I went to the mailbox yesterday, and did the happy dance in front of too many people to count! I had a package from Gina K. Designs, and it contained new stamps! Ha! You all know how sinful it is to put new stamps away before inking them up, so I chose, instead, to put my ladder away for a while and 'play'!!! With no further ado, Theresa Momber's newest set, Hang in There, accompanied me into my girl cave, where I nearly squealed with delight! How much fun these little critters are going to be! I did this card today for Selma's 'Blast from the Past' challenge at StampTV. The challenge called for paper piecing. I pieced the frog with GKD's free (YES, FREE) downloadable green from the Timeless Solids package, and the tree trunk is pieced with the GKD free (YES, FREE) Wood Patterned Paper. The front is sponged with Tim Holtz Distress Ink, Antique Linen, and the stamping is done with Colorbox Chestnut Roan and Olive Chalk Ink. The sky is sponged with Stampin Up's Bashful Blue. You can't see in the photo, but his eye is paper pieced from the 'wood' paper, and is covered with glossy accents, so it looks like a real glossy eye! Well, dear friends, I hope this cute little pop up froggie gets at least one squeal or giggle today! Looks like he's perched up on that tree looking for his princess to kiss! My best ever stamping buddy, Shirley, and I are taking a class from Michelle Zindorf in St. Louis. I'm black and blue all over from pinching myself!!! Hopefully the next thing I post will be a sheer work of art that I make in class tomorrow! I have a card to show you today (I got to 'play' while new carpet was being put in) that I made for the Sketch Challenge at Sunflowers and Dragonflies. Beth always issues the most fun and creative challenges, and I don't get to participate as often as I would like to, so today was fun for me! 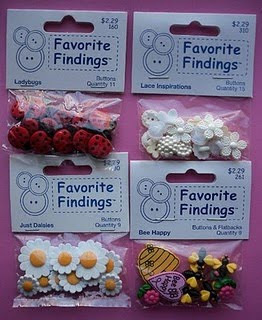 Be sure to check out her blog, AND the Sunflowers and Dragonflies store - they have some adorable stamps! I have used a Sara Kay stamp that I got from Sunflowers and Dragonflies. All coloring is done with Koh-I-Noor Pencils. Hope you like it! I'm off to call the dentist - just broke off a tooth. UGH! Hello everyone, and Happy Monday! It is Nilla's week as challenge hostess at There's Magic in the Air. The challenge uses Nina's adorable image "Lucky Bear". Nilla asks that we use any technique for distressing, roughing up your paper with your scissors, distressing with inks, sanding, scraping, pounding (would work well if you are mad at someone) - any technique that you consider a method of distressing. All coloring is done with Koh-I-Noor pencils, and the distressing is done with Color Box Chalk Ink, Chestnut Roan. The sentiment is hand written. I hope that you like Lucky - he is definitely one of my favorites! Nina has just posted about 25 new images - be sure to run over to her store, Paper Cupcakes, and check out the new goodies! You won't be disappointed! We have been SO busy this weekend! We decided last weekend that we really needed some new family room furniture. We were nearly sitting on the floor, our sofa was so dilapidated! So, we drove into the city, found some that we liked, but just couldn't make ourselves pay for it. We came home, sat on the old stuff again, and decided to look locally. Voila! The same Lazy Boy sofa and chairs were in the showroom about 5 minutes from home. So...we ordered a new sofa with dual recliners, a fabric recliner chair to match, and a leather recliner chair to match. These are to be delivered Tues. morning. Well, Thursday afternoon, DH calls, and says - go buy carpeting. No sense putting new furniture down on old rugs. Well, I never dreamed that the carpet could be measured for and put down by Monday, but guess what, it can!!! So then, he says, well, before we put new carpeting down, don't you think we (you) should paint the woodwork? Then, walking across the old flooring revealed some squeaks, so we ended up pulling up all the old carpeting ourselves so we could screw the dickens out of the floor boards and kill the squeaks! Anyway, point is, this girl has had NO - NADA - ZERO - ZILCH time in her girl cave! Oh, and did I mention that while we were at Lowe's buying drywall screws, we picked out new tile and paint for the kitchen? And that when I start that job, all 47 drawers and doors, and bases will all have to be sanded and repainted? Sigh.... oh, well...it will be SO worth it when it's finished! We've made very few changes in the past 20 some odd years, and it's time! At our ages, this will probably be our last big remodel that we do ourselves, so it's actually a lot of fun! Gotta get back to it! Have a great week, and forgive me for not doing much blog hopping this week! Big hugs - Patti J.
Wow! Two days of sunshine and no snow in a row! It was supposed to warm up a bit today, but the wind is still blowing pretty hard, so it does not feel warmer! I hope that you are all enjoying your day. I had intended to get out to run a couple of errands, but have not made it yet. I took a few minutes a while ago to make a quick card. Those of you that know our Stef (a.k.a. Glitterbabe, the lampshade boogie queen), will certainly recognize her beautiful flower image here! I'm sure Stef meant this to be a vivid yellow Jonquil, but I took the liberty of coloring it pink to fit a challenge I was working on! Check out Stef's Etsy site, where you can find her wonderful images! So, Helen Dooley has started up a new challenge site. It's called For Fun Challenges, and that's exactly what she is stressing - 'for fun'! Well, as I don't believe we girls can ever have enough fun, I'm going to give it a try! The challenge this week is to use Pink, Purple, and Gray. It's not very visible in the photo, but I have stippled around the flower in gray, and the dots on the ribbon are a silvery gray. Why don't you run over to Helen's very first challenge and give her a nice warm welcoming entry?!!? I am also entering this card at Creative Card Crew. The challenge this week at CCC is "Get Well". You have GOT to run over and check out what their design team has posted this week - they are wonderful! There is even a Hangover Kit!!! lolololol..... I'm too old for that, but some of you youngsters might enjoy it! I may have to make up a few of those for 'just in case' occasions! The dotted background, sentiment, and flourish are all TAC Stamps. Have a great Wednesday, and I hope to be back tomorrow with something new. Take Care! My workshop was today. Everyone seemed pleased with what we made. They did like the flourish card that I posted for you to see the other day, so good call! Those of you that have followed me for a while know that when I do a class, all of the participants get a little something that I've made them, just for being there. Here's what they received today...mmm...chocolate! The image and sentiment are from TAC's new sets: Brighten Your Day & Wonder and Joy. Coloring was all done with Koh-I-Noor Pencils and LOMS. Speaking of chocolate, DD and I went to a nearby town, Ste. Geneveieve, Mo., last weekend. This quaint little town has an annual 'Chocolate Walk'. You stop at the first store, buy a ticket for $5, and walk all over town. There are approx. 25 shops on the list. Each shop that you visit has chocolate in some form out on a beautiful tray for you to try - everything from truffles to brownies. Very bad timing, as I had just started Weight Watchers! I tried to be a little careful, and we walked for a LONG time, so perhaps I walked off a few of the calories! Anyway, here, for your enjoyment, is a photo of the chocolate covered strawberries that I picked up for DH while there. Then I came home to beautiful roses that DH had snuck in while we were gone! Loads of red ones, and one white for each of our wonderful kids - what a keeper my man is! All righty, off to clean up my messy craft corner! I'll be checking up on your blogs tonight and tomorrow! I didn't get to use Nina's "Fancy Surprise" image when she released it at the time of our blog hop, so this week was just perfect for it. Selma was our challenge hostess this week. We could choose any image that we desired, but with a couple of twists! We were to use at least one circle and lace! How much fun! I had this funky lace trim that I've been wanting to use on something, so that's what I did! You can't tell from the photo, but the icing, and ribbon are both shined up with some Glossy Accents! Due to some issues here at home, I had to work this up very quickly. I'm not crazy about it, but as some of you have said, "If all our cards were perfect, we couldn't call them challenges"! Hope you like it. I can't wait to see what you create! Have a great week! Yes, I really did it! It's a CAS card from ME - those of you that know me well, know that I am terrified of CAS, therefore, this is really an exciting post! This is actually one of the several items we will make in my workshop on Tuesday, providing we don't get snowed out! I sponged with Tim Hotz Antique Linen distress ink, then stamped with Color Box Chalk Ink, Olive. The sentiment is a Verve, Plain Jane. Food for thought: Sign at a laundromat: "Anyone leaving garments here for more than 30 days will be disposed of. Well, as the sun is mostly out today, hopefully some of my driveway will melt off! Keep your fingers crossed! My thoughts are with all of you that have mountains of the beautiful white fluffy stuff! I have a short post today! Here is a card that I made from some scraps for a small workshop I am doing soon. I would love to know what you think! The sentiment stamp is an Inkadinkado, which I purchased at O'Dear's. I used Versafine black ink. The background stamp is also Inkadinkado, purchased at The Red Rooster. work on some more samples for the workshop! Food for thought: If you look like the picture on your passport, you probably need the trip! Today's card is for a challenge at Creative Belli. I had made a card like this a long while back, and thought of it when this challenge came up. I liked it when I first made it, so I actually cased myself - how fun is that! I just used lots of ribbon scraps, and TAC stamps. Topped it off with a silk flower and fancy button. Question: Has anyone out there done Jenny Craig? Any feedback? Another Question: Anyone have a nice condo in Jupiter Florida for rent for 6-7 days sometime in March? Hey Caryl, if you are reading I GET TO GO TO SPRING TRAINING!!! Wahoo!!! Hope you are having a good day! We have another few inches of new snow on the ground, and with wind chill it was something like -3 this a.m., so this old woman is ripping old wallpaper off the kitchen walls today! Threats of more snow tonight and maybe tomorrow - UGH! Enough, already! Back to work! See you soon! Flight of the Fuschia, that is! Welcome to another Magical Monday at There's Magic in the Air with Paper Cupcakes. Today's image is Nina's beautiful "Flight of the Fuschia". This week, it was my turn to present the challenge. My challenge you is to grab this wonderful image, and create a comforting card, such as: Thinking of You, Get Well, Sympathy, Encouragement, etc. I also offer a little twist - if you have them, include flourishes and/or pearls on your card! It's very hard to see, but I have used Versmark Dazzle and stamped a flourish at the top right and bottom left of my card. The pearls are pretty obvious! All coloring is done with Tombow markers, and the bird is colored with my clear Sakura Gelly Roll glitter pen. The flourish stamp is from TAC, and the sentiment is from Gina K. Designs. 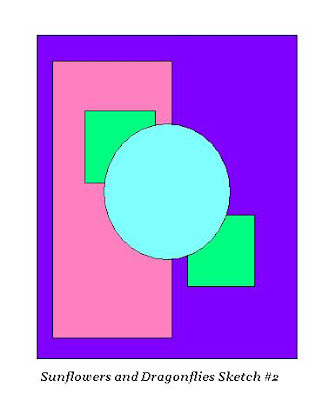 The DP is from a DCWV mat stack. And thanks to my DT sistah, Kim, I am being inspired to finish the inside of my cards as well!!! It was very ironic to me when the image Nina gave me for this challenge was this beautiful dove carrying the Fuschia sprig. I cannot remember a time that my dear mom wasn't growing these lovely plants. She loved them with a passion. When mom passed away in Dec. 1999, the Hospice group brought me a gorgeous china figurine that was doves and fuschia plants. It still sits front and center on our fireplace mantle. This time of year is when I miss mom the most. We have all of the fall and winter holidays, and then her birthday was Jan. 18. The day that I opened my email from Nina with this attachment, I'd actually been having a quiet cry while thinking of mom - thus the irony! Thanks Nina, for unknowingly bringing me some peace that day! Okay, enough of that!!! I hope that your Monday is magical, indeed! With good luck, we will NOT get the additional 5-7" of snow predicted for Mon. and Tues! Have a great day! Can't wait to see what you all do with the Flight of the Fuschia!!! Tonight, my card is in non-traditional colors! The challenge at Frosted Designs is to make a Valentine's project, but to use no red, and no pink. Yippee! What a fabulous excuse to drag out the old standby - black and white! The white is from my stash, the black is DCWV, and the beautiful teal is Stampin' Up's Bermuda Bay. The print is a FREE downloadable DP from TAC. Be sure to check out their free downloads! Hope you like it, and that you are having a great weekend. It's snowed here all day off and on. No 'real' accumulation yet (we probably have an inch or so), but it's supposed to continue for several hours, so who knows what morning will bring! A very special young woman in our community passed away this week. greatly missed by all who knew her. Life is short - hug your kids, tell your DH or significant other just how special they are to you, and cherish each precious day. 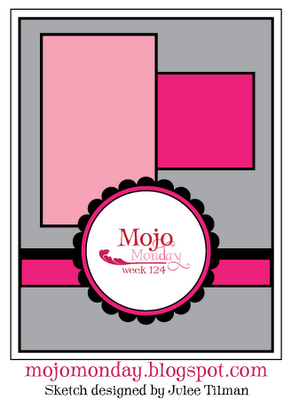 Today's card is for the Mojo Monday 124 Challenge. The focal image stamp is from the TAC, Just Bee-Cuz, that I received from my best ever stamping bud, Shirley, for Christmas - Isn't it a gorgeous vintage baby buggy? The sentiment is from the TAC Ordinary Greetings set, and the DP is from the Just Dreamy 2 line. I received this fabulous DP in a wonderful prize package after winning a challenge at Stamptacular Sunday a few weeks ago. The solid cardstock, the flowers, and the ribbon are also from the prize package (it was definitely like Christmas again). Food for thought: If Walmart is lowering prices every day, why is nothing free yet? Can you believe that it is already February? Seems like we were all just taking a short breather to be with our families for Christmas, and here we are - coloring hearts! Welcome to another Magical Monday at There's Magic in the Air. Today, I bring you Nina's beautiful image, "I Heart You". It is Sue's week to present the challenge! Sue wants to see us use this image in a Valentine gift tag, and include some stitching somewhere on it. Our stitching can be with real thread, or can be hand drawn. You'll note that mine is definitely hand drawn (thanks Sue!)! I filled an old Frappucino bottle with some Lindor Milk Chocolate Truffles (mmmm.....), decorated it with some DP, Pearls, and Ribbon, and hung my tag from the bottle neck. I also made a coordinating gift card. All coloring was done with Koh-I-Noor Pencils and loms. Sponging was done with Tim Holtz Distressing Ink (Antique Linen). Be sure to hurry over to TMITA to pick up YOUR free image! Create something fun with it, enter it in the weekly challenge, and you could win the prize pictured there! When you are finished there, run over to Nina's store and check out her wonderful images! Thank you all for stopping by! I hope to be back in a regular routine soon!